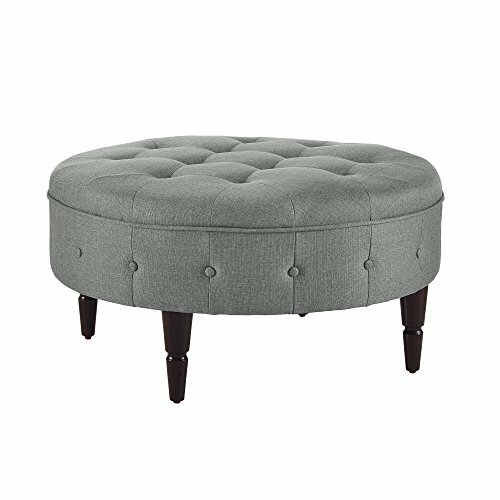 Grace the interior of your home with the eye-catching aesthetics and casual charm of the Dorel Living patty round ottoman. With a classic round profile and a handsome silhouette, the patty makes a great accent piece, perfect to add a bit of traditional flare. Featuring a tufted top with accents and a welted border along the sides, this piece adds an elegance to any room in need of a style lift. It is upholstered in a light gray linen-look fabric that is extremely easy to match with any existing living room decor or style. The solid wood turned legs make it a sturdy, versatile piece, ideal to rest your feet, to place drinks and snacks, magazines, books, or to make a classic statement to any room in your home.